It's hard to believe that we're already into the second half of summer. I know that I say it all the time, but even the kids are commenting on how quickly this year is passing by. It doesn't get light quite as early, and it doesn't get dark quite as late. Plus, the kids go back to school next week. Next week! That's far too soon, in my opinion. Growing up, we never went back until after Labor Day, when the days were crisp and fall jackets were in order. Now, I'm searching for shorts and short-sleeved shirts to send them back in. But my original point was the speed with which summer is flying by. We've blazed through an impressive amount of charcoal this year so far; the grill has definitely been earning its keep. I've had these duck legs on the backburner for more than a month now, waiting patiently for their turn in the spotlight. This was actually my first time cooking duck on the grill. I know, crazy! I was in the mood for a little barbecue, but instead of traditional (to us), I went a little off the beaten path and chose an addictive Chinese barbecue called Char Siu. Well, Char Siu actually means "fork roast" or "fork burn" (not literally barbecue) - a way to flavor roast pork (or traditionally any available meats, especially wild boar). 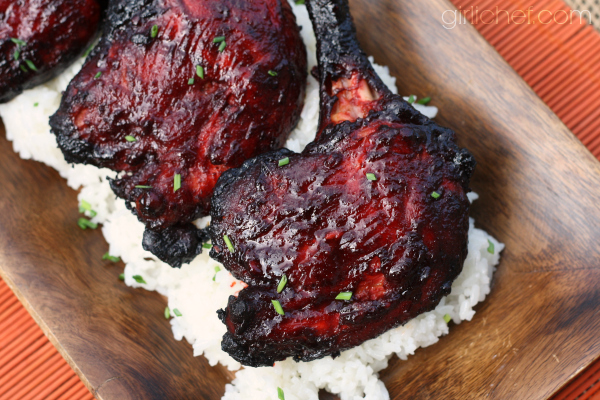 Char siu is recognized by it's red hue, which it gets from the addition of red food coloring. It's optional, though - so if you aren't comfortable adding food coloring or are allergic to it, by all means, leave it out. That said, the red ring that forms on the outer surface of the meat is something that I associate with Char siu. So, on to the roasting part. I roasted the duck legs on the grill over indirect heat. That means only heating the coals on half of the grill. The other half had a foil pan for catching the fat as it drips from the slow-roasting duck legs. It cooks for a couple of hours, turning and basting with the glossy red sauce every so often. The results were nothing short of amazing. You may know I have a penchant for duck, and that I'm encouraging my family to feel the same. These Char siu duck legs were a HUGE step forward. My youngest and my husband went back for seconds and thirds...and were disappointed when there were no more leftovers to be found. Winning. 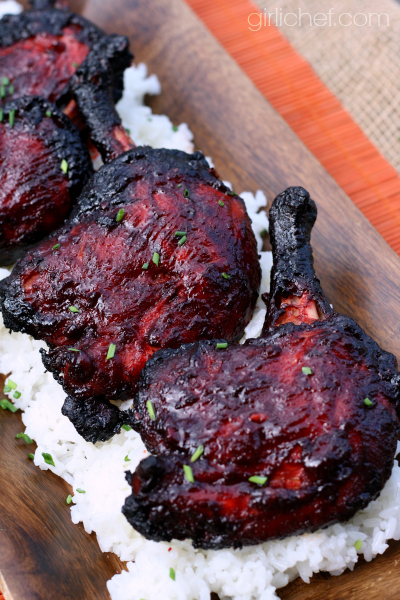 These Char Siu Duck Legs are roast over indirect heat on the grill, and make for a delicious, red-tinged twist on the popular Chinese Barbecue dish. Put the duck legs into a gallon-sized zippered baggie, or a container that will fit them snuggly. Combine all of the marinade/sauce ingredients in a bowl. Add half (1/2 cup) of the marinade/sauce mixture to the duck legs, turning to coat. Seal the baggie, or put a lid on the container. Refrigerate for at least 4 hours or overnight. Store remaining sauce in a lidded container in the fridge, as well. 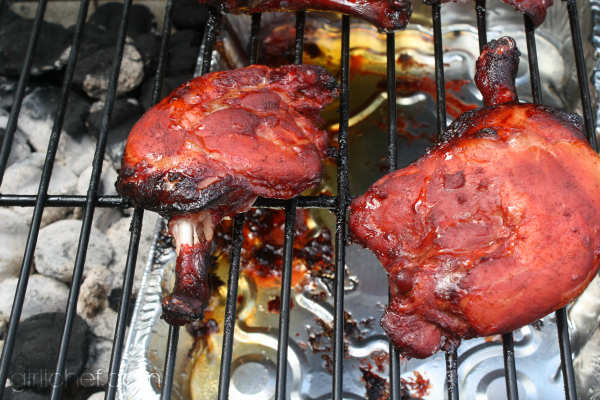 Bring duck and extra sauce to room temperature while you prepare the grill. Preheat a grill, putting charcoal on ONLY HALF to prepare for indirect heat cooking. Set a foil pan on the half of the grate without the charcoal. Once the grill is hot (if you have a grill thermometer, you're looking for around 300° F), set the duck legs on the grate/rack that is sitting over the foil pan. Close the lid and cook for 1 hour. 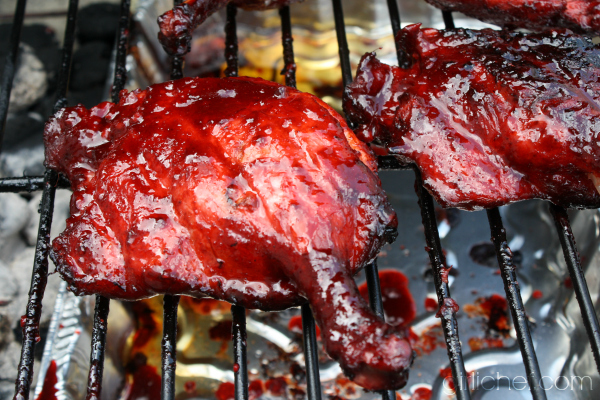 Lift the lid, brush with some of the extra Char Siu sauce, then flip the legs over. Close lid and cook for 20 minutes longer. Brush with more sauce, flip, then repeat the process 2 more times, for a total cooking time of about 2 hours. Meat should be extremely tender and pulling away from the leg bone. 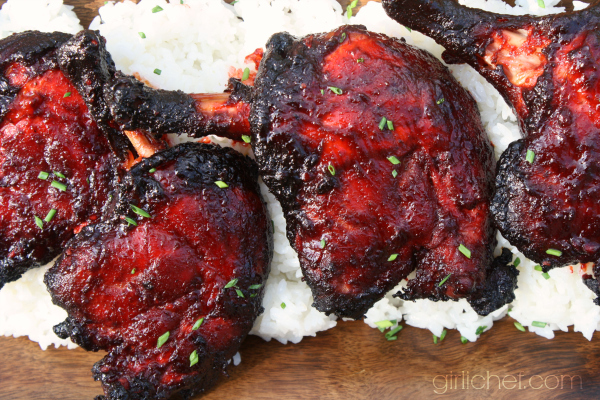 Serve the Char Siu Duck Legs with hot white rice, a drizzle of vinegar if you like, and a smattering of chives. These can also be made by roasting them in a 300° F oven. Set them on a rack that is set in a roasting pan (or something deep enough to catch the fat that is rendered). Baste in the same time frame as you would for the grill. Try this Char Siu sauce on pork (ribs, tenderloin, loin), too...or whatever you like, for that matter. *QUACK FACT: Duck stands up well to bold flavors. Try using it in a recipe that normally calls for pork or beef. Looking for more great DUCK RECIPES? Follow Heather Schmitt-Gonzalez's board Duck, Duck, (no) Goose on Pinterest. I am a Maple Leaf Farms Brand Ambassador. All opinions stated in this post are my own. Interested in learning more about Maple Leaf Farms duck? You can follow my duck tales, or visit the Maple Leaf Farms website where you can find more duck recipes ideas and purchase products online. You can also connect with them on Facebook, Twitter, Pinterest, Instagram, YouTube, or sign up for their Discover Duck Newsletter.